The Visible Thinking website is the brain-child of Project Zero, from the Harvard Graduate School of Education. Project Zero’s mission is to enhance learning, thinking, and creativity in the arts and their website offers some amazing ideas to use in the classroom to do just that. The ‘Colour, Symbol, Image Routine’ can be used to enhance comprehension as it is a ‘…routine for distilling the essence of ideas non-verbally’. Students are asked to identify and convey their comprehension of material they are reading, listening to, or watching, in non-verbal ways, by using colour, symbol, and image to represent their ideas. If you needed something to work those higher-level thinking skills, then this is it. Also, a fantastic activity for those with strengths in the non-verbal intelligences. 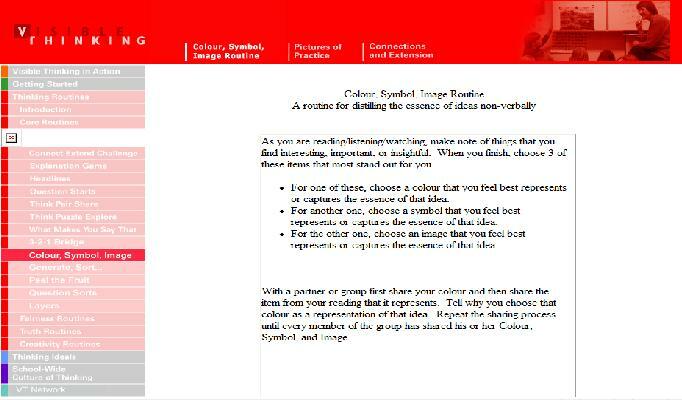 This activity can facilitate discussion of a text or film, as students compare their colour, symbol, or image. A great way to build and expand comprehension.